The largest head-to-head study to date between two leading drugs to treat opioid addiction has found them roughly equivalent — an outcome that could dramatically change prescribing habits and boost the fortunes of the newer drug, Vivitrol. The study, sponsored by the National Institute on Drug Abuse, found that a monthly shot of naltrexone (sold as Vivitrol) is as effective as its main competitor, the daily pill of buprenorphine and naloxone (sold as Suboxone). Researchers found that about half of people with opioid addiction who took either drug remained free from relapse six months later. The finding, however, comes with a major caveat. A large number of people were unable to even start treatment with Vivitrol. That’s because participants had to thoroughly wean themselves off opioids for a period of three days before they could start taking Vivitrol, to avoid sudden symptoms of opioid withdrawal. Because of that hurdle, patients failed to start on Vivitrol at four times the rate that they did Suboxone. 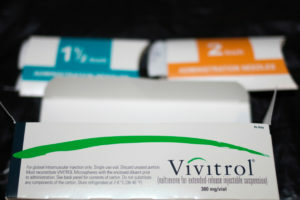 Vivitrol, which received Food and Drug Administration approval in 2010 for opioid treatment, is seen as attractive option because patients only have to take it once a month, and it doesn’t contain opioids. Suboxone, by contrast, has been treated with skepticism by some physicians and officials — including former Health and Human Services Secretary Tom Price — because it’s “substituting” one opioid for another. But Vivitrol, which costs about $1,000 a shot, is also much more expensive than Suboxone, and up until now has had limited evidence showing how well it works. Addiction experts say this study, which confirms the results of a smaller head-to-head trial recently published, offer more clarity at a time where misconceptions have clouded the public’s judgment about treatments for opioid addiction. The research was conducted between 2014 and 2017 at eight community-based inpatient treatment facilities across the U.S. A group of 570 opioid-dependent adults — the majority of whom were white men between the ages of 25 and 45 — received one of the two medication-assisted treatments. Over the subsequent six months, researchers both solicited self-reports of opioid use as well as weekly urine samples. Participants also reported side effects and their level of opioid craving. At the end of six months, 52 percent of those who had received Vivitrol had relapsed, compared with 56 percent of those receiving Suboxone. However, 28 percent of participants assigned to Vivitrol couldn’t make it through the detox period, as compared to 6 percent of people who quit the study before initiating Suboxone dosage. Taking into account all the participants, Suboxone had a lower rate of relapse than Vivitrol. Dr. Joshua Lee, an associate professor with New York University’s School of Medicine and a leading author of the study, which published in the Lancet on Tuesday, said the findings indicate that each drug can help certain patients, rather than one simply being better than the other. But other addiction doctors said that the gap in rates of people who successfully started each treatment was an alarming sign. “The take-home from this study is that buprenorphine [Suboxone] is more effective” than Vivitrol, said Dr. Sarah Wakeman, the medical director of the Substance Use Disorders Initiative at Massachusetts General Hospital. She said the study confirmed what she sees at her clinical practice — that it is easier to initiate Suboxone treatment with patients, and patients stay with the treatment longer. She also pointed out that many of the overdoses in the study occurred after detox — a phase that isn’t required if patients are given Suboxone. Dr. Andrew Kolodny, co-director of the Opioid Policy Research Collaborative at Brandeis University, agreed. “Buprenorphine outperformed naltrexone, period,” he said. One charge the study does settle is that there is a lack of evidence supporting Vivitrol’s touted effects. Alkermes, which manufactures the drug, was dinged by a number of investigative reports earlier this year highlighting the company’s expansive claims about the drug’s potential to investors and its aggressive lobbying of federal lawmakers. Alkermes did not donate drugs to this trial. But two of study’s senior authors — Lee and Dr. John Rotrosen, a psychiatry professor at NYU’s School of Medicine — had received free drugs from Alkermes for an unrelated trial. Two other researchers involved in the study disclosed receiving either research support or consulting fees from Alkermes in the past. In a statement, Alkermes CEO Richard Pops said the “data from the study reinforce the value of [medication-assisted treatment] and the distinct differences between two important options” for opioid-use disorder. Indivior, the company that makes Suboxone, donated drugs to this trial and “had access to periodic safety data only, with no input or review of this manuscript,” according to the study. Volkow, for her part, believes physicians should be prescribing medication out of a series of choices. For instance, Vivitrol might be a better treatment for someone in a rural area because he or she wouldn’t have to drive as frequently to a faraway clinic; chronic pain patients might respond better to Suboxone, as it blocks pain receptors. Ultimately, Volkow feels more long-term research and development of opioid addiction treatments — including extended-release buprenorphine — is needed now to truly know what works best for patients. David Armstrong contributed reporting. This article is reproduced with permission from STAT. It was first published on Nov. 14, 2017. Find the original story here.